U.S. Flag Store's Georgia State Flag is printed in America on Nylon flag fabric. Since this flag is made in America, U.S. Flag Store is able to ensure that the complex State emblems are printed with accuracy, sharp detail and bright colors. This outdoor Georgia State Flag is finished with the same high quality materials as all of U.S. Flag Store's US flags, and is extremely durable and long lasting. Design: The current Georgia flag features two red stripes and one white stripe. In the upper left corner of the flag there is a square of blue with the Great Seal of Georgia placed inside a circle of 13 white stars. The Great Seal includes three pillars with the values of wisdom, justice, and moderation inscribed in a ribbon wrapped around each pillar. Arched above the pillars are the words Constitution and Justice. While the official seal has the legend "State of Georgia" and the date, 1776, included in the border, the flag's version of the seal, includes the legend "In God We Trust" inscribed under the pillars. The seal also features a male figure dressed in Colonial attire. Meaning: The color palette of the flag is the same as the American Flag and honors the history of America, with the circle of thirteen stars representing the 13 original U.S. colonies. The arch in the Great Seal symbolizes the state's constitution, with the three pillars below it representing the three branches of government: legislative, executive, and judicial. Georgia was first established in 1732 as the thirteenth original U.S. colony. 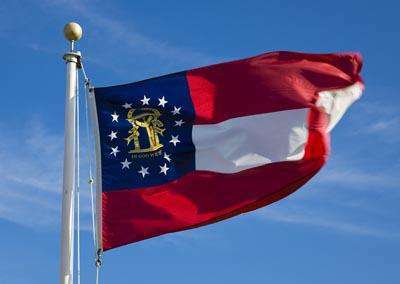 Over a century later, when Georgia seceded from the Union in 1861, the state still did not have an official state flag. However, they did have an official state seal so they simply placed it on a banner and used that as an unofficial state flag. This original design continued to serve as an unofficial state flag until the year 1879, when a Georgia state senator had a new state flag designed. This new flag was very reminiscent of the Confederate States of America "Stars and Bars" flag. The new state flag did not include the circle of stars that the Confederate Flag had, but the basic layout was nearly the same. This version of the Georgia state flag flew from 1879-1902. In 1902 the flag was modified to include Georgia's state seal. This flag maintained the 1879 layout, and simply placed the Great Seal of Georgia over the blue portion of the flag. Between 1902 and 1956 there were a few more alterations of the flag, but they basic layout stayed mostly the same. In 1956, the Georgia flag was greatly modified to include the Confederate Battle flag alongside the Great Seal of Georgia. According to the New Georgia Encyclopedia, the 1956 version of the state flag was possibly a response to the Civil Rights movement and the decisions made in Brown v. Board. The legislation of Georgia was extremely resistant to the integration of public schools, and this modification of the flag was a way to show their dissent. Because of the motivation behind the 1956 flag, there was much controversy surrounding the design of Georgia's state flag. Throughout the 1980s and 1990s numerous bills suggesting a return to the pre-1956 flag were introduced to the General Assembly, but none of them were successful and the flag remained unchanged for many years. Finally, in 2001, the flag was modified again to a flag that included a gold version of the Great Seal of Georgia. The seal of this flag was placed in the center of a blue field and surrounded by a ring of 13 five-point white stars. Below the seal was a ribbon of five flags that have flown over the state of Georgia throughout the history of the state, including the American Flag. The Georgia state flag was modified once again in 2003 to a design that was very similar to the 1902 version of the flag. The Governor of Georgia, Sonny Perdue, had promised Georgians that they could choose their own flag if he was elected. After his election, Sonny followed through with his promise and authorized the Georgia legislature to create a new flag design. The General Assembly proposed a flag design that combined elements of the Great Seal of Georgia and the Stars and Bars of the Confederacy. The legislation of Georgia held a public referendum where citizens could choose between two flags. The new 2003 design won 73.1% of the vote in the referendum, and was made the official flag of Georgia that still flies today.